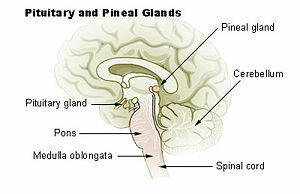 Diagram of pituitary and pineal glands. The pineal gland (also called the pineal body, epiphysis cerebri, or epiphysis) is a small pine cone-shaped endocrine organ found in the skull of vertebrates. It produces and secretes melatonin in a circadian rhythm with higher levels in the dark phase and lower levels in the light phase. The pineal gland appears to be sensitive to small amounts of light that penetrate the skin and skull in some vertebrates or via the retina in mammals. It seems to play a role with respect to circadian rhythms and in some aspect of regulating sexual reproduction or sexual development. However, the importance and role of the pineal gland is not clearly understood, and this mystery has historically led to various metaphysical theories. Rene Descartes called it the "seat of the soul," and others have attributed importance to it in terms of "spiritual vision" or "intuition." The pineal gland is a small body about the size of a pea in adult human beings, located just rostro-dorsal to the superior colliculus and behind and beneath the stria medullaris, between the laterally positioned thalamic bodies. It is attached to the roof of the third ventricle and is part of the epithalamus. In human beings, it lies deep within the brain, but in most vertebrates it lies just beneath the skull. The pineal gland is a midline structure, and is often seen in plain skull X-rays, since it is often calcified. The pineal gland consists mainly of pinealocytes, but four other cell types have been identified: interstitial cells, perivascular phagocytes, pineal neurons, and peptidergic neuron-like cells. The pineal gland in humans consists of a lobular parenchyma of pinealocytes surrounded by connective tissue. The gland's surface is covered by a pial capsule. The pinealocyte consists of a cell body with four to six processes emerging. Insterstitial cells are located between the pinealocytes. Many capillaries are present in the gland and perivascular phagocytes are located close to these blood vessels. The perivascular phagocytes are antigen-presenting cells. In higher vertebrates, neurons are located in the pineal gland, but are absent in rodents. In some species, neuronal-like peptidergic cells are present, which might have a paracrine regulatory function. Human pineal glands contain a variable quantity of gritty material, called brain sand. Chemical analysis of this sand shows that it is composed of calcium phosphate, calcium carbonate, magnesium phosphate, and ammonium phosphate (Bocchi et al. 1993). The pineal gland was originally believed to be a "vestigial remnant" of a larger organ. In 1960 Lerner and Takahashi reported that the pineal gland contained a unique compound, known as melatonin. It was later found to be synthesized in a circadian rhythm, with larger amounts being produced in the dark phase. In cyclostomes, fish, amphibians, reptiles, and birds, the pineal body appears to be directly sensitive to small amounts of light that penetrate the skin and skull. In mammals, with increased development of the cerebral hemispheres, the pineal body came to lie deeper within the brain and indirect stimulation of the pineal gland by light via the retina came to be more important. When the retina detects light, it sends a signal through the optic nerve to the the suprachiasmatic nucleus (SCN) within the hypothalamus. Fibers travel from the SCN to the paraventricular nuclei (PVN), which relay the signal to the spinal cord and then out via the preganglionic fibers of the sympathetic nervous system. The preganglionic cells extend to the superior cervical ganglia where they synapse upon postganglionic fibers, which in turn terminate on the pineal gland. The pineal gland may play a role in human sexual development. The higher melatonin levels in children may inhibit sexual development. Pineal tumors have in some cases been linked to precocious puberty. With increasing age, melatonin production is reduced and calcification is increased. However, the absence of a pineal gland in human beings does not have a consistent effect on sexual development. Removal of the pineal gland in rats results in hypertrophy of the anterior pituitary, the ovaries, and the adrenals (Wurtman et al. 1959). The pineal gland is often referred to as antigonadotrophic and appears to inhibit the secretion of luteinizing hormone (LH) and follicle-stimulating hormone (FSH) from the anterior pituitary. The pineal gland appears to play a role in seasonal breeders, like hamsters. The testes normally become smaller and less active in the winter, when the nights are longer, and become larger and more active in the spring, when the nights are shorter. When the pineal organ is removed, these organs do not atrophy in the winter (Reiter 1973). Thus, the pineal gland seems to be important in providing information not only as a circadian clock but also as a seasonal clock to regulate sexual reproduction. Avian pineal glands are believed to contain a circadian clock that acts much like the SCN of the hypothalamus does in mammals (Natesan et al. 2002). Their pinealocytes are photosensitive and contain melanopsin as well as a unique pigment called pinopsin (Okano et al. 2002). In lower vertebrates, the pineal gland is located on the surface of the brain, directly under the skull, and contains photoreceptor-like structures that may regulate their biological clock (Moore et al. 1967). These structures bear a strong resemblance to the photoreceptor cells of the eye. 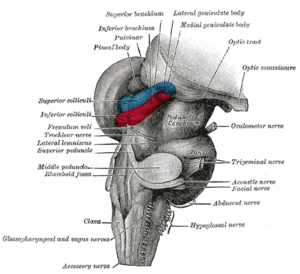 Some evolutionary biologists believe that the vertebrate pineal gland can be traced to a proto-eye structure in early vertebrate organisms (Klein 2004). The pineal gland may offer protection against the actions of drugs of abuse, such as cocaine (Uz et al. 2003) and antidepressants, such as Prozac (Uz et al. 2004), and contribute to the regulation of neuronal vulnerability (Manev et al. 1996). A tremendous amount of research has been done on the pineal organ. Most of the research has centered on the role of the pineal organ in maintaining circadian rhythms. However, much of it has yielded inconsistent results. The importance of the pineal body and its functional role(s) in vertebrates is not yet understood clearly (Macchi 2004). The pineal gland was the last endocrine gland to have its function discovered. This combination led to its being a "mystery" gland with myth, superstition, and even metaphysical theories surrounding its perceived function. Rene Descartes, in the seventeenth century, called the pineal gland the "seat of the soul." The pineal gland is occasionally associated with the sixth chakra (also called Ajna or the third eye chakra in yoga). It is believed by some to be a dormant organ that can be awakened to enable "telepathic" communication. Madame Blavatsky (1888) called the pineal body the "eye of Shiva" and said that in modern man it is a vestigial "organ of spiritual vision." Believers in Discordianism feel that the pineal body is involved in intuition. Lerner, A. B. and Y. Takahashi. 1960. “Isolation of melatonin and 5-methoxyindole-3-acetic acid from bovine pineal glands.” Journal of Biological Chemistry 235: 1992-1997. Macchi, M. M. and J. N Bruce. 2004. “Human pineal physiology and the functional significance of melatonin.” Neuroendocrinology 25 (3-4):177-195. Manev, H., T. Uz , A. Kharlamov, and J.Y. Joo. 1996. “Increased brain damage after stroke or excitotoxic seizures in melatonin-deficient rats.” FASEB Journal 10 (13): 1546-1551. Okano, T., T.Yoshizawa, and Y. Fukada. 2002. “Pinopsin is a chicken pineal photoreceptive molecule.” Nature 372: 94-97. Reiter, R. J. 1973. “Pineal control of a seasonal reproductive rhythm in male golden hamsters exposed to natural daylight and temperature.” Endocrinology 92: 423-430. Uz T., M. Akhisaroglu, R. Ahmed, and H. Manev. 2003. “The pineal gland is critical for circadian period expression in the striatum and for circadian cocaine sensitization in mice.” Neuropsychopharmacology 12: 2117-2123. Wurtman, R. J., M. D. Altschule, and U. Holmgren. 1959. “Effects of pinealectomy and of a pineal extract in rats.” American Journal of Physiology 197: 108-110.